Most whisky fans would no doubt say that a trip to Singapore would not be complete without a visit to the well known and well regarded whisky bar, The Auld Alliance (which Martin reviewed back in 2013, in its old location). As luck would have it, I had planned a trip to the lion city with the family at the end of last year and it was then I finally had the chance to check it out. Let's just say that I was thoroughly impressed with the overall experience, from my own excitement at glistening through pages and pages of different (often rare) whiskies on offer, the bar setup and ambience as well as the generosity of knowledge of the bar staff. I met up with Natasha, the Bar Manager on the night whom Martin had recommended to me and we chatted away on how the bar came about, the extensive range of whiskies and some of their unique independent bottlings. I won't dive in deeper about the bar, but you can read Martin's review from 2013 here, and he's also planning a detailed write-up of the new location soon (needless to say, it's even better). 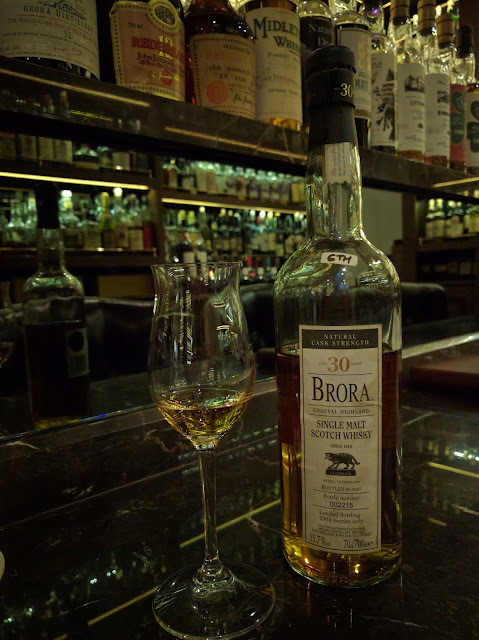 I came across the Brora 30yo 6th Release during my chat with Natasha and she mentioned that the 1977 Brora was a special one given 1977 was the last year before Brora began using lightly peated malt, in 1978. Though one would still question the effect of time on the peat level irrespective of how peaty a whisky can be at the outset - I was curious to try this 6th release from Diageo. A lovely, rich, creamy and complex whisky that is generous with every mouthful. Despite the age, this particular Brora is superbly balanced, you do get the dry woody notes though not without it being complemented with plethora of other sensories including peat, citrus and maritime notes. Nose: The nose is pungent, earthy, ladened with scent of damp forest floor, perhaps reminiscent of raw peat in its origin, ripe banana and overlaid with a small note of metallic paint and heavy thick bonfire smoke. Palate: The palate is rich, very rich, creamy and viscous. The palate is charred, woody and dry. Then there's the peat and citrus notes, loads of peat and citrus fruit notes before the maritime notes arrive, the salty, briny notes. After a while, the palate then slowly fizzled out with a subtle numbing (cardamon) spice. Finish: The finish is long, dry, woody and well spiced. Rating (on my very non-scientific scale): 95/100.